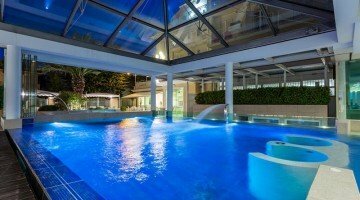 The Hotel Luna Riccione is a 4 stars hotel located in the central area of the city. It has a SPA with heated and covered swimming pool, a congress center, indoor garage, restaurant with international cuisine, elegant rooms and suites. The stay is reserved for people over 12 years. Small and medium-sized pets are allowed. The hotel is located in the central area of Riccione, about 5 minutes walk from the beach and its main course Viale Ceccarini. SUNNY: rooms equipped with 26 "LED TV, Sky Gold package and Pay per View channels; safe, minibar, air conditioning / heating, free WI-FI connection, Building Automation, soft bath sponges, Comfortzone courtesy line, bathrobe and slippers.The Sunny living room includes: a guaranteed parking space in the garage, access to the swimming pools and free water bottles from the minibar. STARS: rooms with the same services as the "Sunny" room.The Star accommodation package includes: unlimited access to the AquaSpa wellness center during the winter, while in summer it includes beach services at the Conventional Bath (2 sunbeds and 1 umbrella), unlimited access to the OpenSky pool, all drinks at the minibar, café, garage parking, 1 Pay per View Sky event, free digital newsstand on smartphones and tablets. LUNA: it's a suite composed of a living area with sofa bed and double bedroom with king-size sommier bed.Available: Frette branded sponges, essence diffusers, 26 "LED TV in the living room and in the bedroom, Sky Gold and Pay per View channels, bathrobe, slippers and Comfortzone courtesy line, safe, minibar, WI-FI, air conditioning / heating and Buinding Automation.The Luna accommodation package includes: entrance to the AquaSpa wellness center in winter and beach service in summer (2 sun loungers and 1 umbrella), unlimited access to the OpenSky pool, all drinks in the minibar, coffee and soft drinks at the bar, bottle of sparkling wine 'arrival with free direction, parking space guaranteed in the garage, 1 Pay per View Sky event, free digital newsstand on smartphones and tablets. HELE: suite overlooking the pool with living room and bedroom, each with its own 40 "TV and Sky channels, walk-in closet, exclusive 25 sqm terrace with relaxing gazebo, sunbeds and private jacuzzi (active from June to September), bathroom with jacuzzi and turkish bath. O'NOR: differs from HELE by the presence of an oval bathtub next to the bed, mirrored ceiling, 70 sqm terrace with relaxing gazebo, sunbeds and private jacuzzi. Both suites include: unlimited entry to AquaSpa, access to the Opensky pool, all drinks from the minibar, drinks from the coffee bar and soft drinks at the bar, a bottle of sparkling wine on arrival as a gift from the management, 1 Pay per View event, guaranteed parking space in the garage, free e-newspapers on smartphones and tablets. Garden, open-air porch, sun terrace, swimming pool, spa, conference center with 5 rooms (max 130 seats), hall, elevator, reading room and restaurant.Bike rental and laundry services available at extra charge. PARKING: garage with 40 spots. WI-FI: free and available throughout the whole structure. BREAKFAST: buffet setted up in the open-air porch facing the pool, it has homemade sweet products, savory and bio products. LUNCH AND DINNER: the refined dining room hosts elegant lunches and dinners with gourmet cuisine. It proposes a 3 choices menu and an a la carte menu, with the possibility to have lunch on the open-air porch by the pool. VARIATIONS: vegan, vegetarian and celiac cuisine. AquaSpa is the hotel's wellness center, equipped with hammam, bio-sauna, emotional shower, turkish bath, ice fountain, relaxation area with herbal teas and the possibility of wellness and beauty treatments.The pool area has two independent pools: a scenic indoor open Sky pool with Skydome that can be opened in summer and water heated up to 32 ° C, and an outdoor pool. There is a conference center with 5 multifunctional meeting rooms that can accommodate up to 130 people. CASSIOPEA: measures 127 square meters and can accommodate from 50 to 130 people depending on the layout. VENERE: room of 79 square meters, able to accommodate from 45 to 70 people. ANDROMEDA: room of 46 square meters with the possibility to accommodate up to 50 people. VEGA: with its 39 sqm it can accommodate up to 30 people. MIZAR: it is 40 square meters wide and can host up to 40 people. 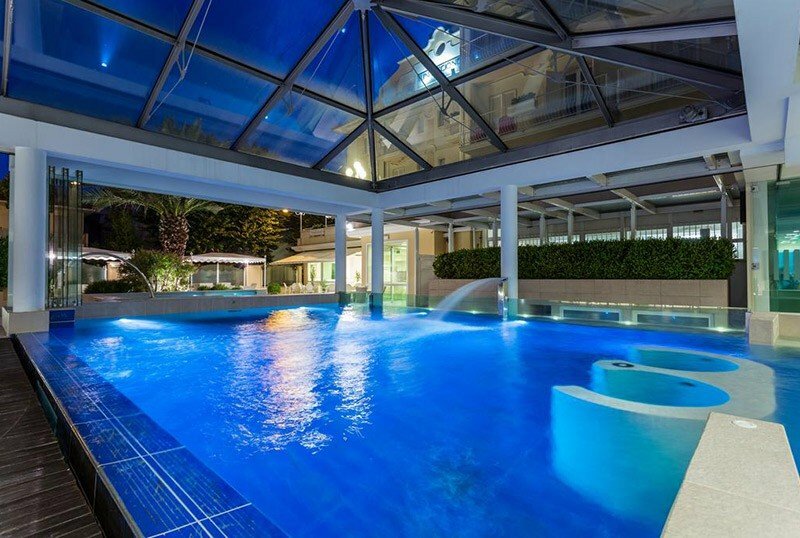 The hotel has an agreement with Bagno Giulia n. 85, an accessible, ecological and environmentally friendly bathing establishment.At guests' disposal: sports fields, entertainment, relax area with library and lounges, sailing courses, hydromassage baths. April 22-May 5 / Total Relax Package 3 Nights + SPA + Massages [comfortzone] at € 510 per room!